After a long weekend of munching on Ribs at the Reno Ribs Fest, I came home wanting to eat anything else but red meat. Luckily, I had something fast and non-meaty in my cooking repertoire for my very tired road companions. And I must say that after sitting in traffic for 6.5 hours, this really hit the spot. I'd also like to note that I generally really don't like pizza. So, it's saying a lot when I actually crave this. Throw in all ingredients into food processor and grind. Pre-heat the grill to high. 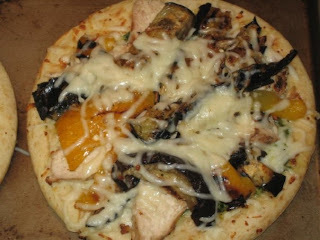 Season the chicken breast, bell pepper, and eggplant (1/4 in. slices) with salt (use the Kiawe one for the chicken), pepper, and olive oil. Grill the eggplant and bell pepper for about 3 minutes per side, until the eggplant is tender and you have nice grill marks. Slice the peppers the eggplant to slivers. Grill the chicken for about 5 minutes per side, then grill on medium for another 3-4 minutes, until the juices run clear. Slice the chicken. Turn the grill back to high and toast the dough for about a minute. Spread pesto and cheese on pizza. Then, add your toppings. (try not to pile it too high, because it cooks fast on the grill) Put back on the grill (the upper rack) for 3-4 minutes, until the cheese has melted. Enjoy! Just that picture made me drool. Then I read the post and drooled more.